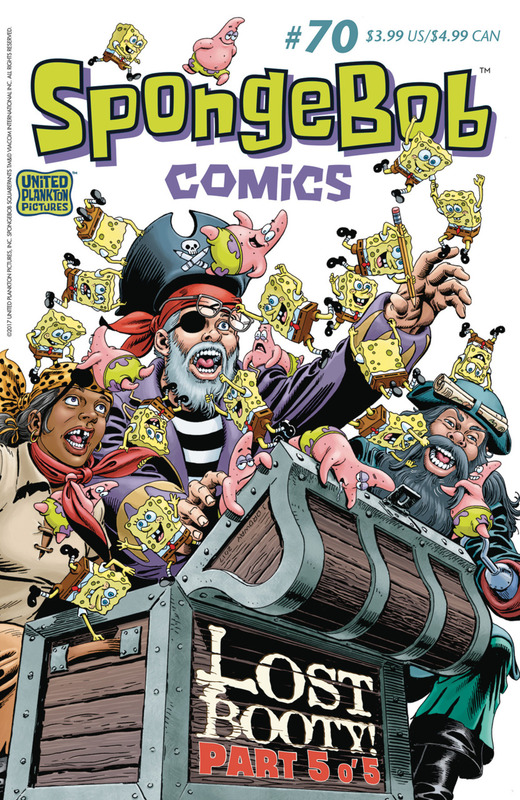 Learn the final fate of renegade SpongeBob Comics artist Pencils the Pirate in the stupefying conclusion to “Lost Booty!” Stranded on a becalmed ship in the middle of the Great Pacific Garbage Patch, Pencils struggles against two frightful foes: a horrible sea monster and, worse, writer’s block! There’s but one thing that can save his nautical bacon – SpongeBob himself! But how will our yellow, porous hero get to the surface in time? Find out in this reality-bending yarn of deadlines and doofuses! Plus underwater floods, ocean facts, and “SpongeFunnies” by James Kochalka!